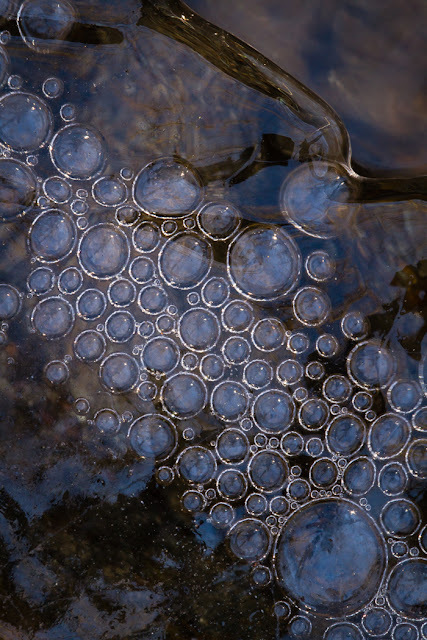 Air bubbles trapped under ice, Gory Brook, Rockefeller State Park Preserve, Sleepy Hollow, NY. Canon 7D, 180mm macro f/3.5L lens, ISO 800, f/16, 1/15 second. 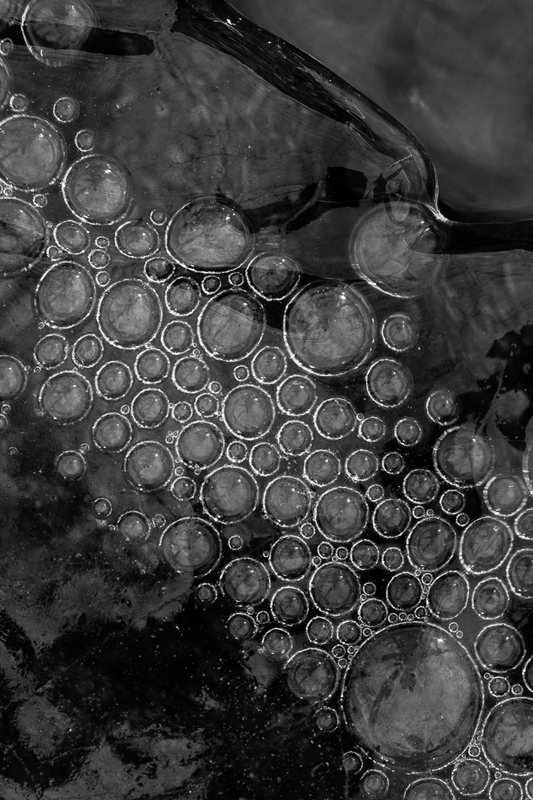 When photographing macro patterns in ice, sometimes I find it beneficial to convert to black and white. The monochromatic treatment tends to really bring out the patterns. Our eye is better able to detect and follow patterns of tone without the distraction of color. A color version of the same photo just doesn't have the same pop as the black and white image above. The blue color of the bubbles and the brown of the stream bed distract from the patterns and shapes, rather than add to it. The other blue reflections in the ice also draw the eye away from and lessen the impact of the circular bubbles. In addition, a black and white image is much more forgiving of larger adjustments to clarity and contrast, which help to emphasize the visual patterns and texture better. 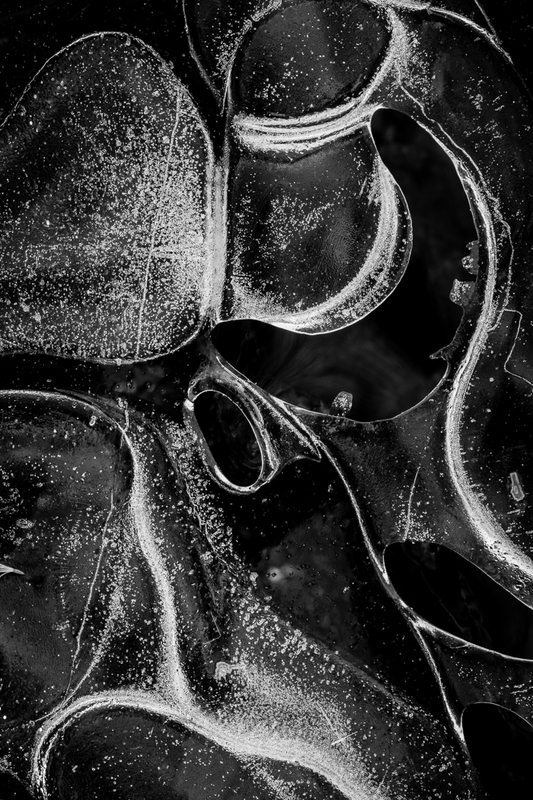 In the next image, a monochromatic treatment gave me the opportunity to really crank up the contrast and deemphasize the background and allow the eye to concentrate on the interesting shapes created by the ice. Gory Brook stream ice, Rockefeller State Park Preserve, Sleepy Hollow, NY. Canon 7D, 180mm macro f/3.5L lens, ISO 100, f/16, 0.8 seconds. The last image in this series, is actually very monochromatic in its original form anyways, but I decided not to convert it to black and white. 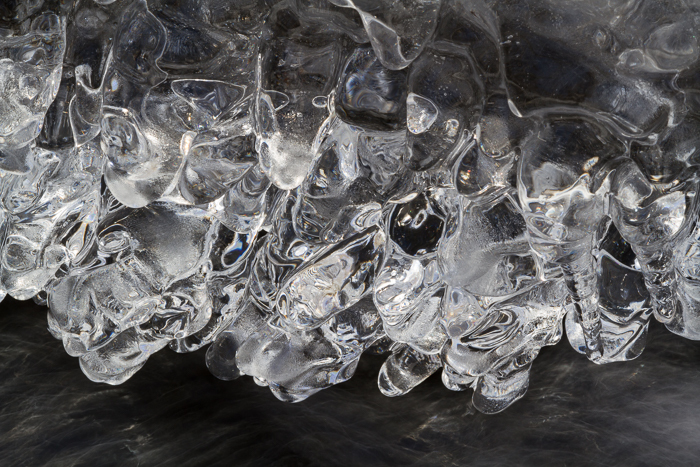 I think the opalescent reflections in the fine details of the ice provide an important point of interest in the otherwise monochromatic scene and add just a tiny bit of magic. Ice formation at small waterfall, Gory Brook, Rockefeller State Park Preserve, Sleepy Hollow, NY. Canon 7D, 180mm macro f/3.5L lens, ISO 100, f/22, 1/8 second.